That last post about the Time Warp must have given The Dancing Cook permission to be sick and choose sleep over the other activities that normally consume her time. Quite a few things are put on hold when mama is under the weather. But today I'm back. And I'm ready to tell you about a dinner you need to make. I just finished my third plate of the best pot roast I've ever tasted. I ate half the three pound thing myself. I was afforded this opportunity thanks to the fact that the roast was finished cooking at 8:30pm. Why dinner wasn't ready until past bedtime is a different story for different day. Two words - Time Warp. At 8:30pm tonight, however, the family had already eaten dinner. I made two dinners this evening. For the folks whose tummies demand food sooner than later I made my Hearty Butternut Squash Soup. It's quick and easy. For those willing to wait on the perfectly roasted perfection of a three hour chunk of perfectness I made The Pioneer Woman's Perfect Pot Roast. In the past, my pot roast has never been anything to write home about. In fact, I'm disappointed every time I try. I've been making bad pot roasts for as many years as I've been married. That's a lot of pot roasts my friends. I do not exaggerate. 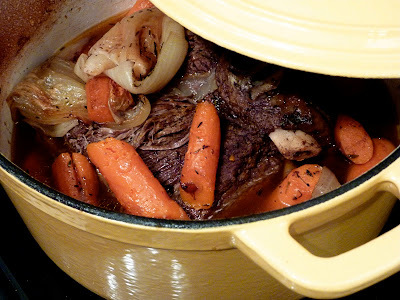 For the recipe check out The Pioneer Woman's Perfect Pot Roast here. It's melt-in-your-mouth delicious. It's fall-apart gorgeous. It's perfect. Finally! To celebrate a pot roast I can be proud of... something that sounds just as good.